This assorted cacti pack is handpicked to offer unmatched quality, texture, and color. The packing is exceptional. Shipping cold sensitive plants can be tricky, however, the plants you receive will be healthy and unaffected by inclimate weather. This stunning pack of four 2 inch cacti are meant to add instant effect to any space. The quality of our 2″ plants is unmatched and we guarantee no duplicate species in our 4 and 8 packs. 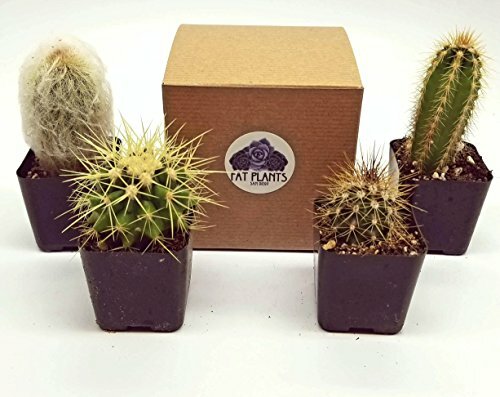 Each order is meticulously packaged in Fat Plants San Diego retail packaging, which makes these mini cacti a perfect gift! These plants come fully rooted in their 2-inch pots. All orders are packaged to protect the plants in transit, and come with detailed care instructions. Please be sure to promptly remove the plants completely from their boxes upon arrival and keep in mind that post-transit, the plants will need fresh air, water, and sun. Comments from recent customers are “Awesome products!”, “Quality plants”, “They were perfect!”, “Everything was packaged carefully ….” and ”Beautiful cacti, wonderful company”. As of March 11, 2018, every review was Five Stars!